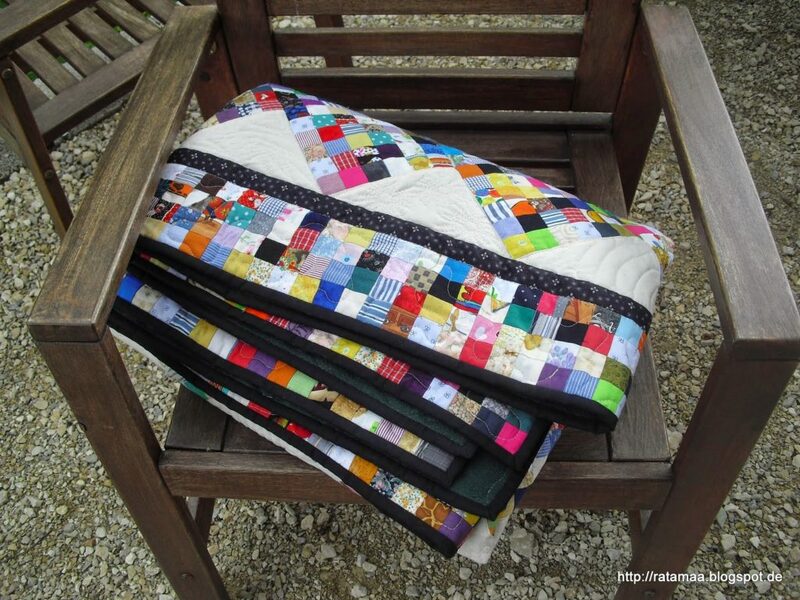 Der letzte Post zu Quilt 2! Denn er ist endlich komplett fertig. Beim Binding annähen ist mir wieder mal was passiert. Aber seht selbst. 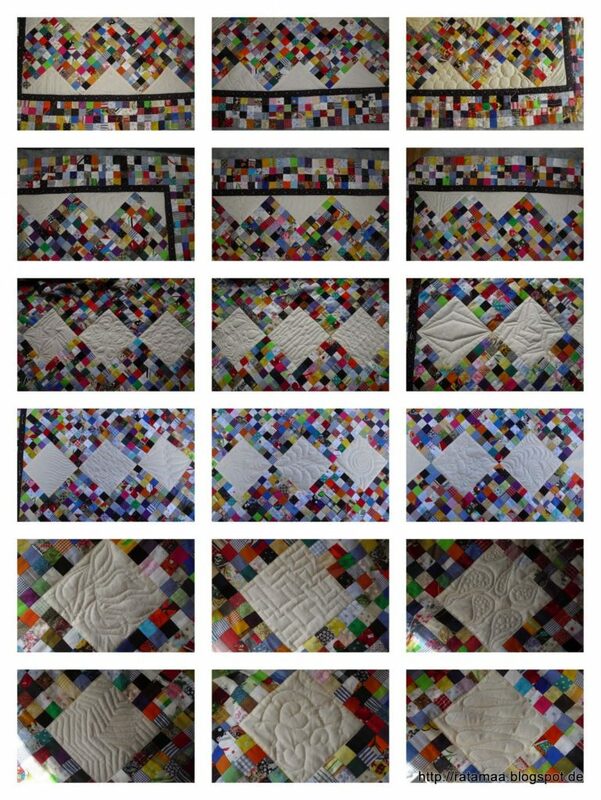 Last post about Quilt 2! He’s completely finished. I made a little mistake on the binding. But see yourself. Aber jetzt ist alles repariert und er wartet brav auf die Übergabe an die Kellerquilter. But now he’s repared and is waiting for the transfer to the Kellerquilter. Und damit darf ich Punkt 6 auf meiner Finish-A-Long Liste von Quartal 2/2014 als erledigt abhaken! Now I can mark point 6 as finished on my Finish-A-Long list Q 2/2014! This quilt is so beautiful! I love that you used so many coloured squares in your zigzags. Wow the postage stamp look with the design is AMAZING. Wonderful work! An amazing quilt! I love all the little tiny blocks! 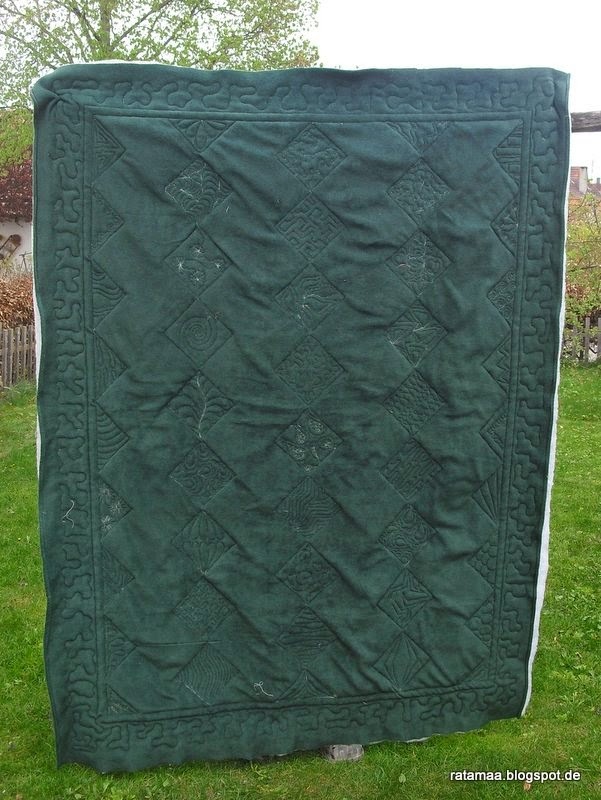 ein wunderbarer Quilt und ich mag das Quilting!!! So pretty! And what a scrap-buster! What a wonderful quilt. 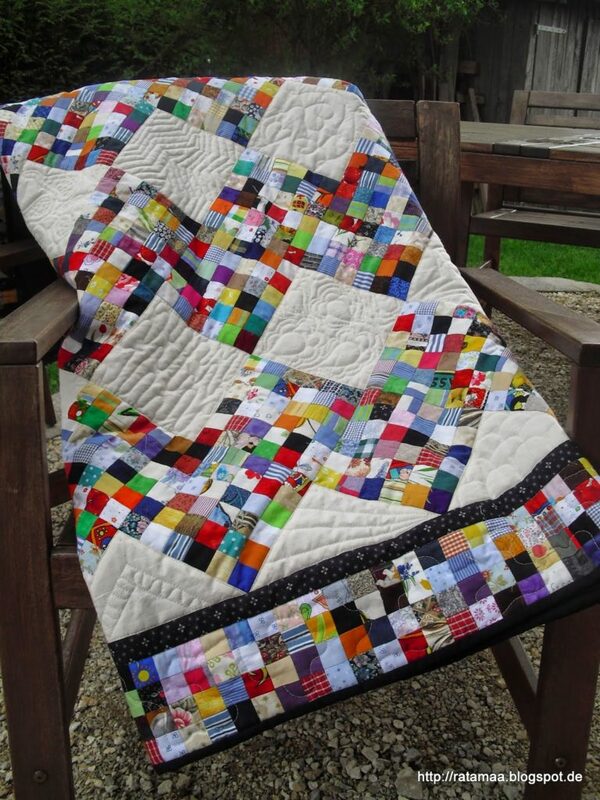 I love the combination of scrappy fabrics and plain quilted squares. 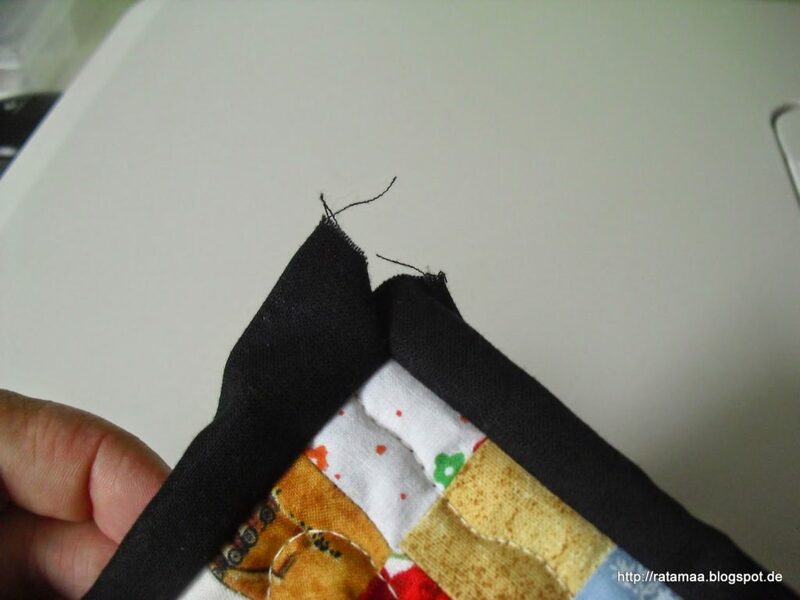 And yes, I sliced through the corner of a quilt's binding a few months ago. Makes you feel really stupid, doesn't it. A beautiful quilt! I love the scrappy fabrics in the zig zags!! well done! 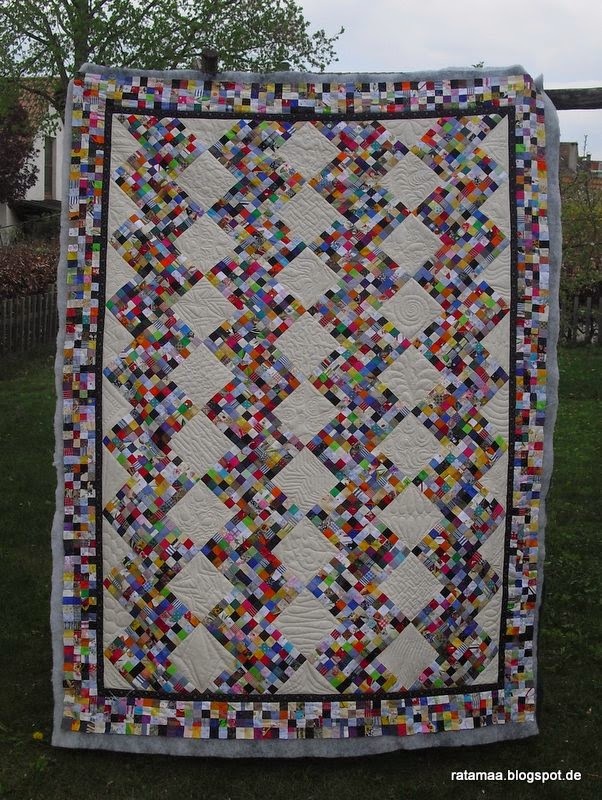 This is such a bright and cheery quilt!